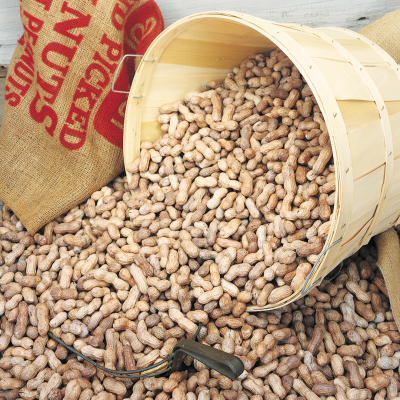 Our Jumbo Roasted-in-the-Shell Virginia Peanuts are packed by the peck -- 5 lbs. in authentic country baskets. A fun and nutritious snack for all ages. Unsalted. Continental US only. 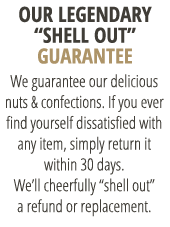 Best if eaten within 30 days. Keep these peanuts fresh longer by refrigerating or freezing them. Bulk item. Ships in own box. Must ship standard or expedited. Additional $5.00 charge applies. Available for shipment within the Continental U.S. only. Ships separately. Ordered a 5 lb. basket of in she'll peanuts. First order arrived with a bad taste. Called customer service and they immediately sent out a replacement order. Second time great taste! Will continue to order from VA Diner. My memories of the Virginia Diner go back to the early 1950's, traveling to Norfolk with my father; the diner was always a manditory stop. Still the same quality and hospitality as then! No comparison with the supermarket peanuts, plus I use the nice baskets to hold gifts.